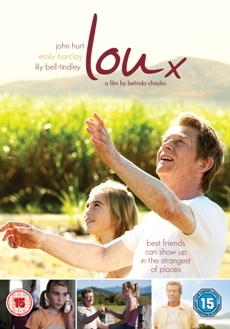 Lou (2010), directed and written by Belinda Chayko (Bored Olives ) and starring legendary British actor John Hurt, is a tender, heartfelt film about one girl’s rite of passage. Set against the dramatic landscape of rural New South Wales, harried single mum Rhia (Emily Barclay) struggles to bring up her three daughters, hounded by debt collectors and the fear of being left on the shelf at twenty-seven. Rhia is also having problems with her eldest daughter, 11-year-old Lou (a stunning debut from Lily Bell-Tindley) who she relies on to look after her younger sisters when she’s at work. Both mother and daughter feel abandoned and blame the other for the abrupt departure of Lou’s dad ten months earlier. Desperate for money, Rhia agrees to temporarily take in her father-in-law, Doyle (Hurt in a pitch-perfect performance), who is suffering from Alzheimer’s and waiting for a hospital bed to become available. But it is Lou, rather than Rhia, who gradually befriends and looks after the former merchant seaman. At first, Doyle is confused and causes chaos with his frequent outbursts, erratic wanderings and irrational night-time fears but things take an unexpected turn when he starts to believe that Lou is actually his former wife who left him for another man. In between bouts of paranoia, Doyle softens and begins to court Lou who, flattered by the attention, goes along with his fantasy. Relations between mother and daughter become further strained when Rhia, worried where it might all lead, forbids Lou to play along with Doyle. Lou, already dealing with the uneasy transition from childhood into puberty, has to confront her own fledgling feelings for the boy next door which, in turn, arouses Doyle’s jealousy. Inevitably it all comes to a head and Lou decides to take flight with Doyle. Lou is Chayko’s first major film in a decade (her main body of work is in television) and it is impressive how much she achieves on a low budget. There is much to admire, from Hurt and Barclay’s finely nuanced performances to Bell-Tindley’s assured debut. Australian Hugh Miller’s wonderful cinematography, in particular the burning of the cane fields, interspersed with the claustrophobia of the domestic scenes, adds a dreamlike quality to the film. Miller also captures the shimmer of the heat haze and the sense of wide open space stretching for miles around. As a dissection of familial relations, Lou is flawless and the deliberately understated emotions of its principle characters are also part of the film’s charm. But despite some stunning landscape shots, and a terrific cast, this low key drama about finding love when you least expect it, remains essentially a small screen rather than a cinematic experience.